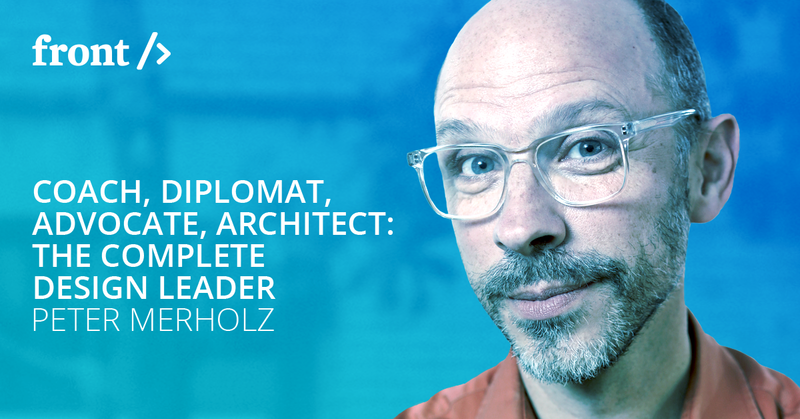 In the run up to Frontend Conference Zurich this August, Katja Dreher, UX Architect at Unic, caught up with Peter Merholz to discuss his experience and thoughts on the subject of Design Leadership. Unic: What is the role of design in the creation process of new technology services? Peter Merholz: It’s important that we clarify what we mean by design. In my book, and in my workshop, I argue that “all design is service design,” because, basically, all the companies we work for are delivering services. Design teams sense customer and user need through their research efforts, take those insights and prototype new potential experiences, gather feedback on these prototypes and refine those ideas, and then work with cross-functional teams to see these ideas get produced and put into the market. Design is crucial because, even at the earliest stages of the process, it makes ideas concrete, which allows people to understand the implications of a business’ strategy early in the process. In your book “Org Design for Design Orgs” you explain about the qualities of effective design organizations. What are the opportunities for design teams? The opportunity for the design team is to be seen as a peer and partner to other major functions in the organization, such as marketing, product management, engineering, and sales. In order for that to happen, the design team must earn that place–it’s not going to be handed to the team. We wrote that chapter to help design teams assess their maturity, and identify how they might be getting in the way of their own success. You are describing core design skills. Which skills does a design team need and why? Thinking of design culture, how can design leaders develop a design culture and what do they have to pay attention to? It’s important for design leaders to start with articulating the values of the design organization – what does it stand for? At Snagajob, we had the values of Quality, Context, Evidence, Fearlessness, and Humility. Those guided how we worked and how we hired, and by making the values explicit, it helped ensure a coherence in our efforts. Those values are then realized through the environments in which we operated, and the activities we engaged in. The next role of the leader is to make sure they are embodying the values, that they demonstrate them through their actions. Design leaders are role models for their team, taking their cues from how their leaders behave. How can ethical values be taken into account in today's technological debate? Designers play a key role in bringing ethics to technological services, because designers are typically the main engine of humanism in the product development process. They seek to understand their users and customers people, and represent their voice and desires to the broader team. This naturally leads toward an ethical stance, because this approach leads to empathy and compassion for these users, and a desire to treat them right. From my point of view, it’s not just that ethical values should be taken into account when developing technological services, but they should be foundational in their development, ensuring that what is built serves users, and society, in an ethical fashion. Who should attend your workshop at the Frontend Conference and why? My workshop is great for design leaders of all stripes (senior practitioners, managers, and executives), and their product management and marketing peers. A key motivator for this workshop (and our book) is a recognition that companies are investing more and more in design, but not setting up their design teams for success. Design leaders should attend in order learn what organizational practices make your team more effective, and thus realize more of the potential of that investment.